Find the best food dehydrators at Pleasant Hill Grain. We select only the highest quality food dehydrators to offer our customers, and we've found American Harvest food dehydrators, L'Equip food dehydrators and Excalibur food dehydrators to be the finest food dehydrators in the world. 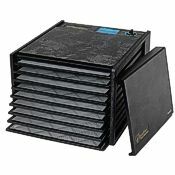 American Harvest food dehydrators are very popular in part for their expandability: up to 30 dehydrator trays can be added for 30 sq. ft. of dehydrator surface. 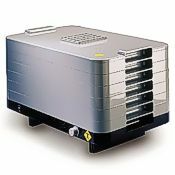 L'Equip food dehydrators are favored by many for their compact size and striking design. Excalibur food dehydrators have a strong reputation; their users appreciate the freedom to remove any food drying tray without moving other trays. Food dehydrator recipes are found in the How To Dry Foods coobook. 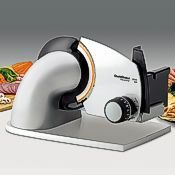 A food slicer is a good companion machine for your food dehydrator, producing slices of equal thickness for the most even dehydrating. Fruit leathers are homemade fruit rolls. They are a tasty, chewy, dried fruit product. Fruit leathers are made by pouring pureed fruit onto a flat surface for drying. When dried, the fruit is pulled from the surface and rolled. It gets the name "leather" from the fact that when the pureed fruit is dried, it is shiny and has the texture of leather. The advantages of making your own fruit leathers are to use less sugar and to mix fruit flavors. Leftover fruit pulp from making jelly can be blended and made into fruit rolls. For the diabetic adult or child, fruit leathers made without sugar are a healthy choice for snacks or desserts. Individual fruit leathers should contain the amount of fruit allowed for the fruit exchange. Directions follow for making fruit leathers. Fresh, frozen or drained canned fruit can be used. Drying removes the moisture from the fruit leather so that bacteria, yeasts and molds cannot grow and spoil the fruit leather. It also slows down the action of enzymes, but does not inactivate them. Because drying removes moisture, the food becomes smaller and lighter in weight. Select ripe or slightly overripe fruit. Wash fresh fruit or berries in cool water. Remove peel, seeds, stems and bruised or spoiled portions. Cut fruit into chunks. Use two cups of fruit for each 13" X 15"fruit leather. Puree fruit until smooth. If thick, add liquid to bring to a pouring consistency. Add two teaspoons lemon juice or 1/8 teaspoon ascorbic acid (375 mg) for each two cups of light colored fruit to prevent darkening. Optional: To sweeten, add corn syrup, honey or sugar. Corn syrup or honey is best for longer storage because it prevents crystal formation. Sugar is fine for immediate use or short storage. Use 1/4 to 1/2 cup sugar, corn syrup or honey for each two cups of fruit. Saccharin-based sweeteners could also be used to reduce tartness without adding calories. Aspartame sweeteners may lose sweetness during drying. Home preserved or store-bought canned or frozen fruit can be used. Applesauce can be dried alone or added to any fresh fruit puree as an extender. It decreases tartness and makes the leather smoother and more pliable. Use one pint of fruit for each 13" X 15" leather. Puree fruit until smooth. If thick, add liquid to bring to a pouring consistency. Add two teaspoons of lemon juice or 1/8 teaspoon ascorbic acid (375 mg) for each two cups of light colored fruit to prevent darkening. To add interest to your fruit leathers add spices or flavorings. Spices to Try--Allspice, cinnamon, cloves, coriander, ginger, mace, mint, nutmeg or pumpkin pie spice. Use sparingly, start with 1/8 teaspoon for each two cups of puree. Flavorings to Try --Almond extract, lemon juice, lemon peel, lime juice, lime peel, orange extract, orange juice, orange peel or vanilla extract. Use sparingly, try 1/8 to 1/4 teaspoon for each two cups of puree. For drying in the oven, a 13" X 15" baking pan with edges works well. Line pan with plastic wrap being careful to smooth out wrinkles. Do not use waxed paper or aluminum foil. To dry in a dehydrator, specially designed plastic sheets can be purchased or plastic trays can be lined with plastic wrap. Fruit leathers can be poured into a single large sheet (13" X 15")or into several smaller sizes. Spread puree evenly, about 1/8 to 1/4 inch thick, onto drying tray. Avoid pouring puree too close to the edge of the sheet; leave an inch or more of border to allow for spreading during drying. The larger fruit leathers take longer to dry. Leather dries from the outside edge toward the center. Test for dryness by touching the center of the leather; no indention or sticky spots should be evident. Dry until it is still pliable. While warm, peel from plastic and roll, allow to cool and rewrap the roll in plastic wrap or special plastic fruit leather sheets. DEHYDRATOR DRYING: It takes approximately six to eight hours for fruit leather to dry in a dehydrator. Follow manufacturers directions. In general, fruit leather should be dried at around 140 F.
OVEN DRYING: An oven can be used for occasional drying of fruit leathers. Because the oven may also be needed for everyday cooking, it may not be satisfactory for preserving abundant fruit leather. Oven drying may take up to 18 hours for fruit leathers. Oven drying is slower than dehydrators because the oven does not have a built-in fan for the air movement. (However, some convection ovens do have a fan.) It takes two to three times longer to dry fruit leather in an oven than in a dehydrator; thus, the oven is not as efficient as a dehydrator and uses more energy. To Use Your Oven--First, check your dial and see if it has a reading as low as 140 F. Check oven temperature on warm setting with an oven thermometer. If your oven does not go this low, then your food will cook instead of dry. Low humidity aids the drying process. To dry fruit leather, the water must move from the fruit leather to the surrounding air. If the surrounding air is humid, then drying will be slowed down. Avoid drying fruit leather during rainy or humid weather. Increasing the air current speeds up drying by moving the surrounding moist air away from the fruit leather. To speed the drying time, increase the air flow. For air circulation, leave the oven door propped open two to six inches. Circulation can be improved by placing a fan outside the oven near the door. Change the position of the fan frequently during drying to vary the circulation of the air. CAUTION: This is not a safe practice for a home with small children. Because the door is left open, the temperature will vary. Place an accurate and easy-to-read oven thermometer on the top tray toward the back. Adjust the temperature dial to achieve the needed 140 F.
Maintain the temperature at 140 F. It takes less heat to keep the temperature at 140 F as drying progresses, so watch the temperature carefully toward the end of drying. Place wrapped pieces in airtight, moisture proof containers such as freezer bags, glass jars or freezer storage containers. Fruit leather will keep about two to four weeks at room temperature when stored in a dark, cool place. For storage up to one year, store in the freezer. 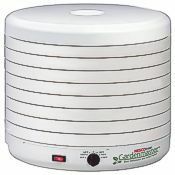 Find the best food dehydrators at Pleasant Hill Grain. We select only the highest quality food dehydrators to offer our customers, and we've found American Harvest food dehydrators, L'Equip food dehydrators and Excalibur food dehydrators to be the finest food dehydrators in the world. American Harvest food dehydrators are very popular in part for their expandability: up to 30 dehydrator trays can be added for 30 sq. ft. of dehydrator surface. L'Equip food dehydrators are favored by many for their compact size and striking design. Excalibur food dehydrators have a strong reputation; their users appreciate the freedom to remove any food drying tray without moving other trays. 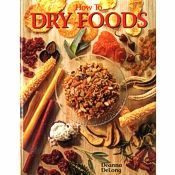 Food dehydrator recipes are found in the How To Dry Foods coobook.